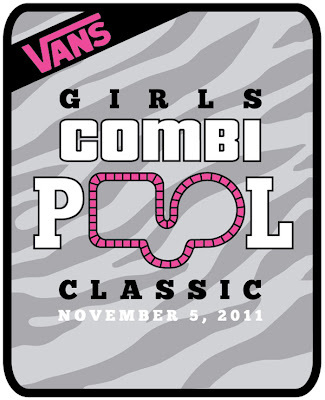 For the second year in a row, there was no ladies division in the current Pro-Tec Pool Party that was held in March of 2011 at Vans every year since 2005. But the female competitors were more of a sideshow, said Cara-Beth Burnside, to one reporter today. She added that "It was kind of a 'let's just do the girls so we can get on with the guys." 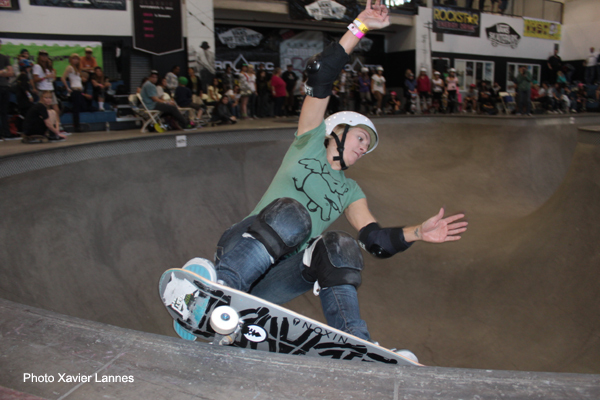 Therefore the ladies had been hungry for the contest at the Girl Combi Classic, an event that has already go down in the history books as one of the best (and possibly the best) bowl contest for female skateboarding. Or, in the words of Competition director Jenn Kotter not only it's an important step for the sport because they didn't get the full experience when it was men and women together it is an "anchor". 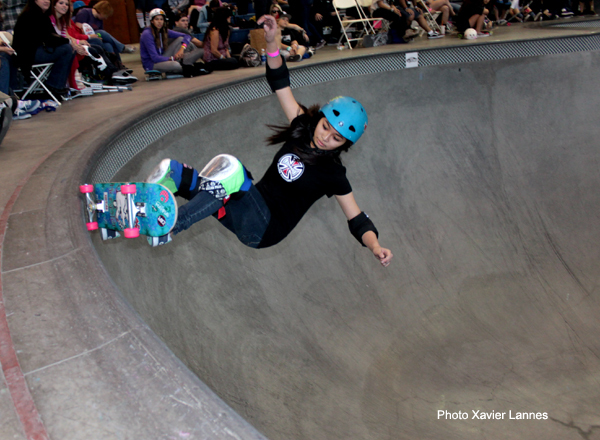 When the best bowl rider girls invaded the Combi Pool this weekend for the second all Girl Combi Classic there was a lot of action going on. Everybody enjoyed watching the girls rip up the pool in the jam sessions and the level was a big notch upon last year’s level! 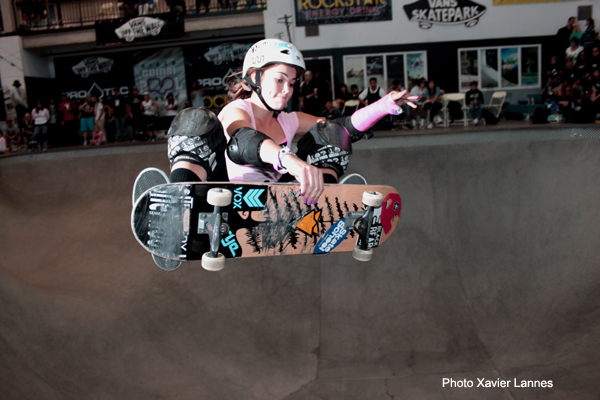 Believe me; the girls have learned a lot of tricks in one year so the girls were ripping, as usual... Lizzie Armanto, Allysha Bergado, Amelia Brodka, Mimi Knoop, Julie Kindstrand, Nora Vasconcellos, Justyce Tabor, Abby Zsarnay, Mandy Esch, and Jen O'Brien all advanced to the finals. Allysha Bergado won the contest and the $3,500 check for her efforts. She threw down all sorts of tricks while riding one of the best pools on the planet today. 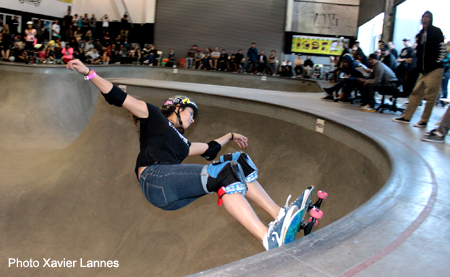 She was flowing around both pools like she has been born there and her runs were loaded with flawless tricks, including an amazing stalefish and a round of double grabs. Mimi Knoop, the Action Sports Alliance co-founder landed second thanks to her incredible indy airs. The 33 year old pro received $1,800 in prize money. 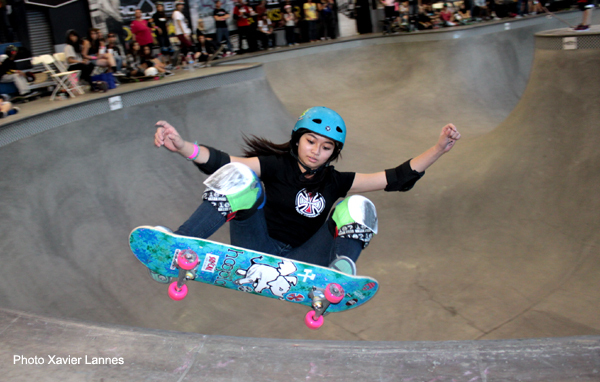 Lizzie Armanto arrived third. 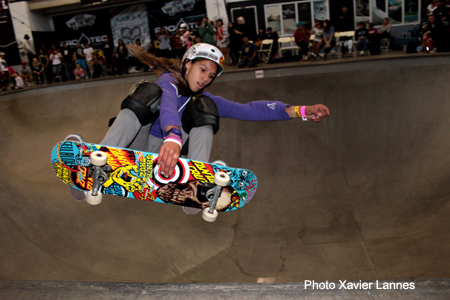 Lizzie Armanto from Santa Monica, CA who won the first ever Girls Combi Pool Classic held on November 20, 2010 at the Vans Skatepark (last year) finally arrived second. 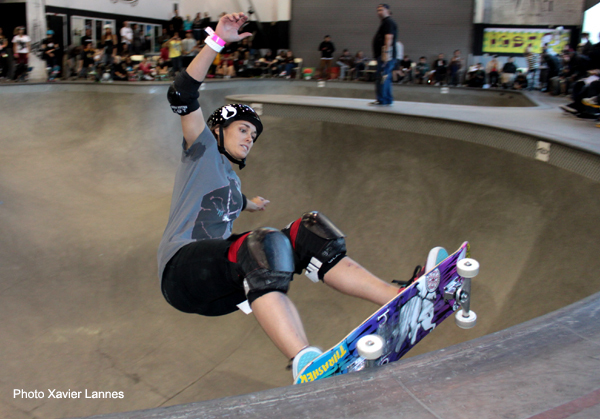 Lizzie Armanto has won other World Cup Skateboarding bowl events this year, including the Tim Brauch Memorial in San Jose, the Oregon Trifecta and Florida Bowlriders. In the end, thanks to dazzling runs and consistent skating , including stylish runs and some beautiful, powerful lines that used the whole pool. She threw down all sorts of tricks like rock’n roll boardslides, sturdy feebles to fakie, stalefish frontside airs, corner airs, extreme big backside airs, textbook backside disasters and 50/5O but that was not enough to beat Allysha today whose intro run was a killer. Julie Kindstrand and Amelia Brodka respectively wrapped up the division's top five. 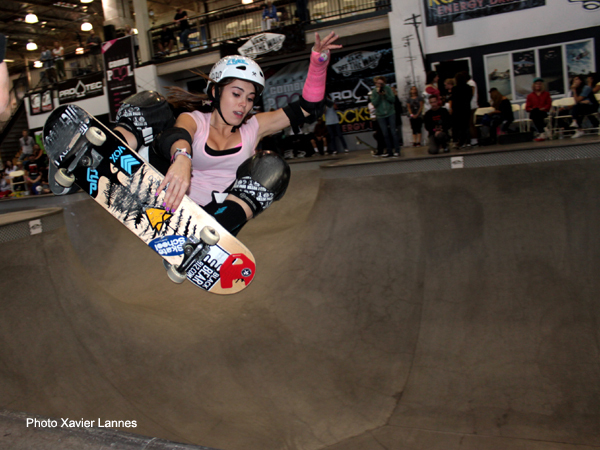 from Hoopla, Patty Segovia from the All Girl Skate Jam, Courtney Pain with the Girls Riders Organization (GRO) and Jaime Parker with Silly Girl and Gibson guitars for their sponsorship and support. The past Pro-Tec Pool Party Champions and the existing WCS Bowl Series Champion automatically advanced to the Girls Combi Pool Finals. The contest was also a time to remember James Van Doren, the co-founder of Vans, who just passed away at the age of 72 a couple of days before the contest, leaving behind a legacy of iconic shoes and devoted followers. What began as a simple skateboarding shoe in 1966 turned into a symbol of the burgeoning Southern California skate culture. Vans were the shoes of a beachside counter-culture; the thick, rubber-waffer-souled lace-ups and slip-ons were not mean to be kept clean. They screamed to be scuffed, ripped and worn until a telltale hole appeared on the toe. The Vans shoes were used to do nose wheelies, kickflips and dafies and later ollies... Vans was there to protect your feet in mosh pits and carry California's youth wherever they wanted to go. The holy moment of the company came with the creation of the checkered slip-on. Originally created only in black-and-white, these flexible, sturdy shoes remained suitable for skating but with an aesthetic that appealed to a much larger crowd. People became obsessed with the shoe, which was later rereleased in an assortment of updated colors, including neon pink and black or electric blue and black. Since then, Vans has collaborated with artists, musicians and creative visionaries to create skate shoes that have become powerful images of fashion. Vans now come decorated with hearts, flowers, skulls and American flags. There are special edition, rubber-toe low-tops named for pro skateboarder Tony Alva, and a pair of plaid high-tops honoring Pearl Jam. But it is the Vans classic models that have captured the hearts and minds of generations of sneaker-wearers. Shoes like the Vans Authentic, Slip-on, Chukka Boot and Era surface in film, television, music and fashion, first in California and then in the rest of the world. Sean Penn's character in "Fast Times at Ridgemont High," Jeff Spicoli, sported a pair of checkered slip-ons and soon rocketed the shoes to mass popularity and eventually to the touring rock concert Vans Warped Tour. Multiples artists sung Vans: The Suicide Machines created a song in 1993 titled "The Vans Song,". Then, The Berkeley high schoolers Pack released their ode to the canvas shoes, simply titled "Vans." In 2006, Lupe Fiasco put out his own song about skateboarding called, "Kick, Push." "So they kick, push kick, kick, push kick, push kick, push, coast. So come and skate with me, just a rebel looking for a place to be." You can almost hear the whoosh of wheels on cement. Vans has been there for skateboarders sin 1966 thanks to James Van Doren and his familly and will be here for the next several decades.